» BIGFOOT; Is He Alive and Well in Happy Camp? 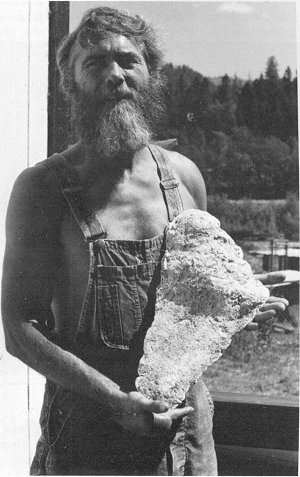 Lars Larson holding a plaster casting which he poured to preserve one of the Bigfoot footprints near Indian Creek, Happy Camp, California. Footprints of a size and shape consistent with those of the legendary Bigfoot were recently discovered on a mining claim belonging to The New 49’ers, on Indian Creek, near Happy Camp, California. Lars Larson, a New 49’er member who was mining on the claim, discovered several of the footprints which measured a whopping 17 inches long, and 11 inches wide! Three of the prints were in gravel and were not distinct; but one was on solid ground. Lars was able to make a plaster casting of the print. Happy Camp is well known as “Bigfoot Country”. The first sighting of one of these elusive creatures was made on Thompson Creek, a nearby tributary of the Klamath River, during the 1860’s. A group of Chinese workers, who were building a ditch to carry water to a hydraulic mine, sighted one. They were so frightened, they refused to return to the job. Today, a very large metal rendering of Bigfoot created by local artists stands on the edge of Highway 96, and is the first thing you see when arriving in Happy Camp from the east. A carved wooden statue of Bigfoot stands in front of the Happy Camp Post Office. Local markets sell tee-shirts featuring these creatures. The annual celebration in Happy Camp is known as “Bigfoot Days,” and features “Bigfoot” in a cage, tossing candy to the local children during the parade. Lars reported that he searched the surrounding area thoroughly, but was unable to find any further evidence, such as broken branches, tufts of hair or any additional footprints. If Bigfoot remains out there somewhere, he clearly desires not to be seen, and he has many miles of forest where he can remain secluded. Some of us prefer it that way also.